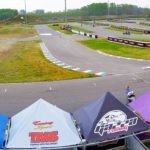 Ottobiano, Pavia (Italy) 14 April 2019 – With clouds and rain falling from the sky above the region of Pavia, Sunday’s race day in started on Ottobiano Motorsportpark in Ottobiano. Despite the weather the spectators found their way to the race track already early in the morning and enjoyed the races from the grandstand alongside the track. After a long winter break 23 riders were at the start for this first round of the S2 Supermoto European Championship season, ready to give the spectators some good shows. In the S1 class it was TM Factory Racing rider Thomas Chareyre who took the overall victory. In the S2 Lites class it was Simon Vilhelmsen who took the overall victory, while the Junior class was won by Jannik Hintz. When the lights dropped for the first time this season in Ottobiano, it was Phoenix Racing rider Markus Class who took the holeshot into the first fast right corner of the circuit in front of TM Factory Racing rider Thomas Chareyre. Right behind Chareyre it was Phoenix Racing rider Elia Sammartin and TMS Motorsport rider Milan Sitniansky. After his holeshot Markus Class made an mistake and the fast German rider crashed in the second corner of the wet racetrack. Class had to restart the race from almost last position but by the end of the first lap Class was already back in 13th place determined to make up for his lost time. Another rider who had a good start was Degasoline rider Pavel Kejmer. Kejmar had to start from the third row but halfway the opening lap the Czech rider was in fourth position chasing the top three. Right behind Kejmar it was Birba Racing rider Gioele Filippetti who also felt at home in the difficult conditions on the track. The teammate of Chareyre at TM, Diego Monticelli had a difficult first lap and was in 17th positions when he crossed the finishline for the first time. With Class out of the top of the race, Thomas Chareyre wasted no time and pushed his TM as hard as was possible on the slippery track. Already after a few laps, the Frenchman had created a gap of 20 seconds to the rest of the field. Second place halfway the race was still for Elia Sammartin but Pavel Kejmar was closing in every corner. Kejmar clearly felt at home in the rain and with 5 laps to go he managed to pass Sammartin for second place. After a small mistake Milan Sitnianky was also passed by Gioele Filippetti which made him fifth in the race. From seventh place at the start, Danish rider Simon Vilhelmsen was very fast underway and with a few laps to go, Vilhelmsen managed to overtake Sitniansky and Filippetti leaving him in fourth place. In the meantime Markus Class was still climbing his way through the field but 8th place, right behind his teammate Nicolas Cousin, was the maximum for the German rider. In front Thomas Chareyre made no mistakes and finished in first place, 21.436 seconds in front of Pavel Kejmar who took second place. Last place in the top three was for Elia Sammartin on more than three seconds of Kejmar. The battle for fourth was still going on between Vilhelmsen and Sitnianksy but Vilhelmsen kept the door closed and took fourth place, followed by Sitniansky in fifth position. With the rain falling down harder and harder, race two started in the afternoon. At the start of race two, it was TM Factory Racing rider Thomas Chareyre who took the holeshot in front of Phoenix Racing rider Nicolas Cousin and his teammates Elia Sammartin and Markus Class. Fifth place in the first corner was for Birba Racing rider Gioele Filippetti, who was just in front of Degasoline rider Pavel Kejmar and the teammate of Chareyre at TM, Diego Monticelli. Milan Sitniansky had a bad start and had to start the race in 19th position after the first lap. With the conditions getting more wet every lap on the track all riders were trying to find best speed. In the second lap Pavel Kejmar crashed together with Giovanni Bussei in the off-road section and both riders had to restart from last place. In the lead the battle was over after a few laps as Thomas Chareyre found a speed which was too high for his competitors and soon the gap to the rest of the field was more than ten seconds. The battle for second place was more intens as the three teammates from Phoenix Racing were not far behind each other. Nicolas Cousin managed to get away from Elia Sammartin, but the Italian rider had Markus Class at the back of his Honda. In the next lap Class, pushed his bike in front of Sammartin and took over third place in the race. Behind the top four it was still Filippetti in fifth but the young Italian riders pushed his TM to much and in one of the fast corners he crashed his bike into the grass. Filippetti could restart his bike, but had to retire from the race. With the riders in front of him crashing, Diego Monticelli took over fifth place behind Sammartin. Monticelli tried to get closer to his fellow countryman but the conditions on the track were too slippery and Monticelli decided to go for fifth. In front Chareyre was now more than 25 seconds in the lead and took his second race win of the day. Nicolas Cousin finished in second after a strong solid race, in front of Markus Class who completed the top three in this race. 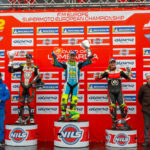 Fourth place went to another Phoenix Racing rider Elia Sammartin and the top five was completed by Diego Monticelli. With his two race wins Thomas Chareyre offcourse took the overall victory. 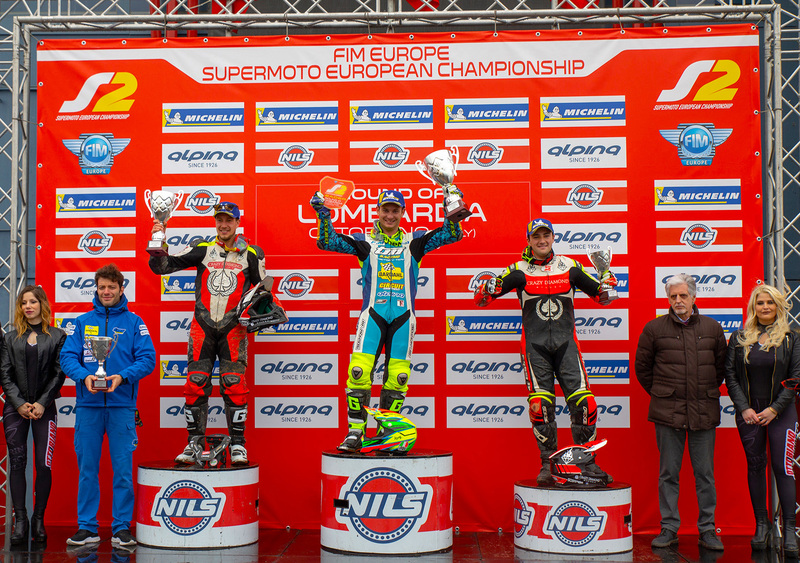 Second spot on the podium was for Elia Sammartin and the podium was completed by Nicolas Cousin. In the S2 Lites class it was Simon Vilhelmsen who took the overall victory, while the Junior class was won by Jannik Hintz. 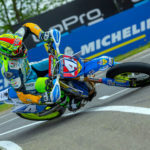 The next round in the S2 Supermoto European Championship which will be held at Busca, Italy on Saturday 18 may 2019.